I appreciate the power of a promise. 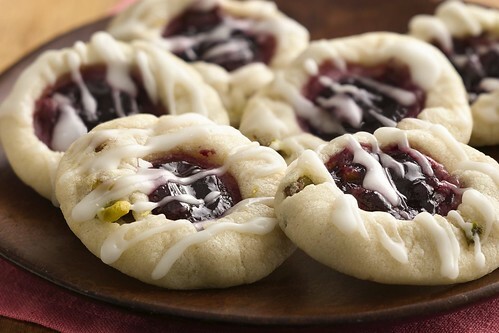 And these cookies, designed by Joan Cossette of Colbert, WA offer a delectable one: "Each bite of these sugar cookies promises a bit of sweet jam and a drizzle of sweet icing." Oh, yum. Heat oven to 325°F. Line large cookie sheets with parchment paper. Let cookie dough stand at room temperature 10 minutes to soften. In large bowl, break up cookie dough. Add pistachios, flour and lemon peel. Mix with wooden spoon or knead with hands until well blended. Place 2 inches apart on cookie sheets. With thumb or handle of wooden spoon, make indentation 3/4 inch wide in center of each cookie. Spoon about 1/2 teaspoon jam into each indentation. Bake 10 to 13 minutes or until set but not browned. Remove to cooling racks. Cool 3 minutes. In small bowl, mix powdered sugar, honey and 1 tablespoon water until smooth. If necessary, stir in water, 1 teaspoon at a time, until of drizzling consistency. Drizzle honey glaze over warm cookies. Store in covered container.